Approximate locations of the four reported robberies. Detectives are investigating four robberies reported in the Town Hall (19th) police district on Christmas Eve and Christmas Day—three in Lakeview and the fourth in Uptown. The Uptown victim was a woman who told police that three offenders followed her from the Lawrence Red Line station around 1:30 a.m. on Christmas Eve. The men battered the woman and stole her phone, purse, and wallet near the intersection of Lawrence and Winthrop, police said. All three offenders escaped in a dark four-door vehicle, the woman said. She described the robbers as three black men: one wearing a black sweater, one wearing a red hoodie, and the third wearing unknown clothing. 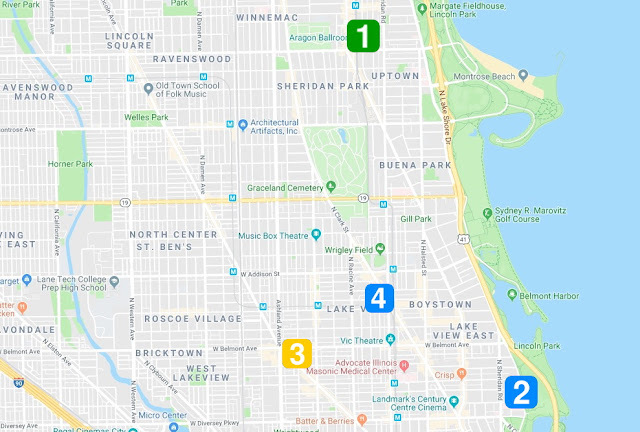 The Lakeview incidents began around the same time with a carjacking near Diversey Harbor. A 32-year-old man was sitting in his parked car in the 2700 block of North Lake Shore Drive when a dark-colored vehicle with a female driver pulled up alongside him A male exited the vehicle, opened the victim’s unlocked door, and forced the victim from the vehicle, police said. No description of the offenders was available. Then, at 10:30 p.m. on Christmas Eve, a gunman tried to rob a woman in the 3000 block of North Greenview. The offender pulled a gun on the victim and demanded her valuables, but he got cold feet and fled to a dark sedan that was waiting nearby. He was described as a white male in his 30’s who has a goatee and stands about 6-feet tall. He was wearing a tan or gray hoodie and ripped jeans. The victim said his car was last seen heading southbound on Greenview from Lincoln. Early on Christmas Day, a Lakeview man was robbed by two offenders in the 3300 block of North Kenmore. The robbers approached him around 2 a.m. and took his wallet, phone, and cash, police said. Both offenders then ran southbound on Kenmore and then eastbound on School Street. Police said the two robbers were black males, one wore a gray hoodie and a mask, the other was thinner and wore a red hoodie.